This fast, fresh and healthy dinner will make it weekday meal rotation easily! It comes together in 20 minutes, using fresh and wholesome ingredients. 2 14.5 oz cans of roasted diced tomatoes undrained (regular diced is fine too). 1 pound raw medium size shrimp. Thawed if frozen and diveined. Saute onions until soft - about 5 minutes. Add garlic and sauté an additional 2 minutes. Add 1/2 cup of feta, shrimp, basil and parsley. Top with kalamata's and additional 1/4 cup feta cheese. 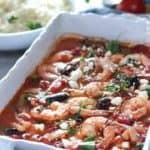 Bake for 10-12 minutes or until shrimp are just cooked through. Serve with pasta or bread and a salad.